Book More Business You Deserve It! Every entrepreneur who has poured their heart, sweat and resources into their business to make it grow deserve to get stellar sales results. 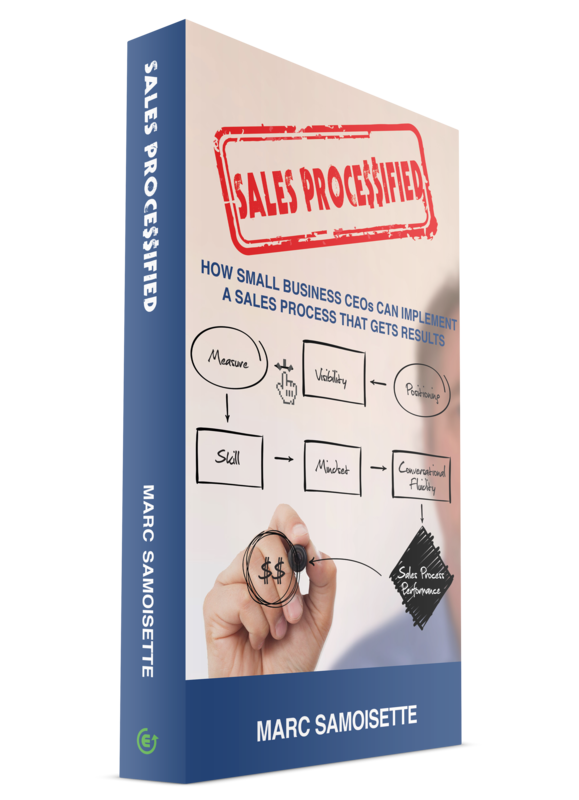 In this new book, Sales Proce$$ified, Sales Process Design&Implementation Expert Marc Samoisette removes the mystery around sales and how CEOs can easily set and implement their unique sales process using Marc’s Sales Performance Implementation Framework. Sales performance is much more about science and process. By following the six key dimensions of the Sales Performance Framework you will ensure the growth you deserve. Take the time to establish the uniqueness of what you offer. You must have visibility into the important sales opportunities. Make sure you have process in place to do that. You can’t improve what you can’t measure. KPI’s must be in place in critical areas. Take action and implement constant learning so that your client-facing people are always adding value and insight to their prospects. Take action on keeping the mindset of your client-facing people at the top of their game. The right skill at the right time for the right person. No one size fits all! Can I actually map out my sales process from lead generation to close? Do I have a process or methodology for each step in my sales process? Do I know which KPI’s I should keep an eye on to make sure I attain my results before it’s too late to correct? Do I have a way to objectively measure the chances of a deal closing? Do I have the right players in place? What skills do my client facing people need to generate leads? Do I have good coaching practices in place? Is my sales force calling high enough? Is it clear to me how my sales force should be navigating through a complex sale? Do I know all the criteria that makes a prospect a good match to our organization? Find out about the six dimensions that you need to activate and maintain in order to keep your sales process producing to the level that your organization deserves. "New information makes new and fresh ideas possible"
Copyright Elevate Coaching ©2019. All Right Reserved.